Blog author Jen Jope is a content marketing manager for All Star and member of the Philanthropic Program Committee. While I’ve rarely, if ever, pondered my coworkers’ kitchen skills, I have now seen proof they can slice, dice, scramble and sauté. The best part? It was all for a great cause. As part of All Star’s new Volunteer Time Off initiative, 11 employees recently skipped a day in the office to shop, cook and serve meals for a truly inspiring organization: the Seattle Urban Academy (SUA). 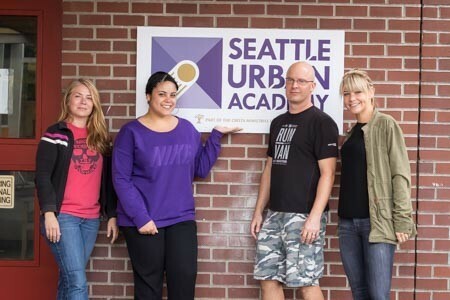 Seattle Urban Academy, founded 16 years ago, provides a formal high school education and stability to at-risk youths. 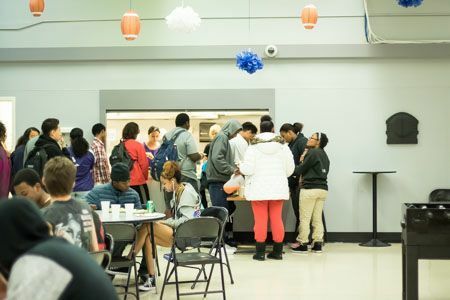 What started as a drop-in tutoring center quickly morphed into a school dedicated to helping low-income minority students. The program is so successful that 91 percent of SUA graduates pursue higher education or go on to sustained employment. The mind-blowing part? They do all of it on a skeletal budget; the staff is only paid about 81 percent of what public school teachers earn. Money for school supplies is scant and the teachers must fundraise to fulfill those needs. The school’s nutrition program—which provides breakfast and lunch—relies entirely on donations and volunteers. When we put out the call for five to seven volunteers for one day of service, we should have known better. When All Stars are given the chance to help the community, they come running. With 11 volunteers (and monetary donations from a few who couldn’t make it), we were able to offer Seattle Urban Academy two days of meal service. On the first day, we quickly got to work cracking eggs, searing sausages and chopping fruit at 7 a.m. As we worked, the first two students walked in. Their happy demeanor – heartfelt thank-yous all around – proved to be a testament to the school. Lunch prep came next. With chicken quesadillas on the menu for 42 people, there was little time to waste. As we chopped and sautéed peppers and onions, shredded chicken and browned the tortillas, some members of the staff breezed in, curious about the aroma wafting through the halls. 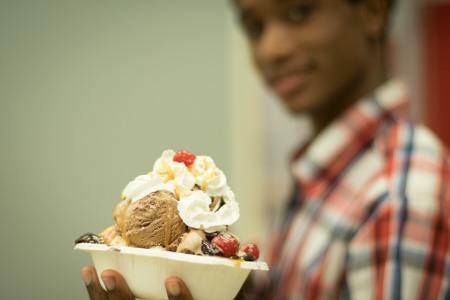 While adults and kids were thrilled with the warm lunch, dessert—ice cream sundaes and Nutella-slathered croissants—proved to be a big hit.